Interview with Lydia Machova: language mentoring 101. Have you heard of language mentoring? Our latest guest on the Mango Languages podcast will give you a crash course. Lydia Machova explains how she encourages and motivates language learners to reach their language goals. Lydia explained that every language she has learned has been because there was a need or that she found them interesting. For example, when she was a university student, she worked at a call center where she serviced customers in English and German. While she was there, her department announced that if she could do the same job in Polish, she could make one Euro more per hour, which was great motivation for her as a student. Polish was actually the most difficult language she ever learned because of its similarities to Slovak and Czech, Lydia’s native languages. There are many false friends between these languages, which can lead to miscommunication. “Even today, I really have to concentrate when I speak Polish,” Lydia remarks. The grammar found in Slavic languages are quite similar to one another. Lydia often finds herself accidentally adding Czech endings to Polish words. As another example, she started learning Esperanto because she had heard how easy and simple the language is to learn. In fact, the grammar has no exceptions! Once she’d learned the language, she got involved in the community, which motivated her to learn more. In total, Lydia has learned English, German, Spanish, Polish, Esperanto, French, Slovak Sign Language, and Russian. Currently, she’s working on maintaining her Russian and Esperanto. (She will be speaking at an Esperanto conference in Slovakia). In addition, Lydia is planning on visiting more post-Soviet countries so that she has chances to use her Russian. 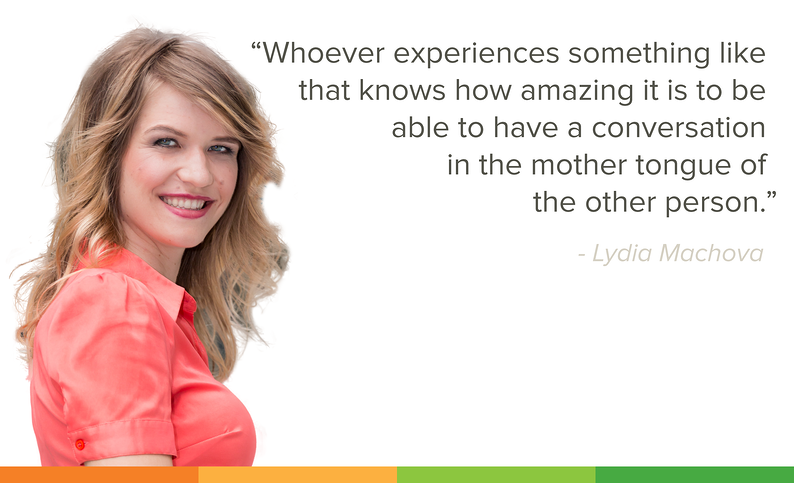 Lydia originally got into language mentoring after she had been teaching for a few years. With mentoring, “it’s not about the teaching, it’s about the learning methodology. It doesn’t matter how good of a teacher you are [...] I see the role of the teacher more like a guide. This is what I’m trying to achieve with language mentoring.” She started leading a group of students through the mentoring process and five weeks in, the students were surprised by how much progress they began to make in their languages. During the interview, we presented Lydia with a proposition: Let’s say I want to learn Russian. You are my mentor. I have no experience in language learning. What are you going to tell me as a language mentor? Lydia replied that in order for the mentor-student relationship to work properly, you need to put in a lot of hours and study consistently. Simply an hour a day can do wonders for you in a few weeks. Just as running a mile a day can do wonders for you physically, studying your target language regularly can help you to keep your language skills “in shape” for the long run (no pun intended). Once, she was talking with someone from Kazakhstan and the group she was with were all speaking Russian. The man from Kazakhstan seemed to be a very serious individual. Someone entered the conversation who did not know Russian, so they all switched to English. Suddenly, the Kazakh changed — he became the life of the party! Lydia asked him about this and he simply said that he acts differently when he speaks Russian than he does when he speaks English. We asked her about how she feels when people say things like, The only language you need to learn is English, because it is the lingua franca of the world. Lydia replied that “English is the lingua franca right now. We can just admit that because it’s true." However, she continued by providing an anecdote: Imagine that there is a group of Spaniards having a conversation. If you enter the conversation they may think to speak in English, but you say, ‘it’s ok, I speak Spanish, you all can continue.' You will see a sparkle in their eye because they will be glad that they won’t have to work as hard to have a conversation. "Whoever experiences something like that, knows how amazing it is to be able to have a conversation in the mother tongue of the other person." If you would like more information about Lydia and her method for learning languages, you can contact her at lydia@languagementoring.com. Be sure to also check out the full interview below for more language-learning wisdom. Click below to see if Mango's 70+ languages are available for free through your library. Happy learning!